June 2006 As you know, for the past fifty-four years or so, I've been trying to devise a way of drawing cartoon strips in 3D (in the style of the old 3D comics of the fifties, such as 'Mighty Mouse' and 'Adventures in 3D' - the first 3D comics I ever saw), with varying degrees of success. 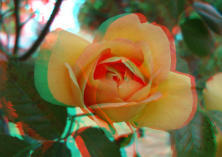 More recently, I've been trying to track down software that would enable me to convert artwork to 3D, but with no luck. And then it came to me. I didn't see why it wouldn't be possible to use Elements 2 to perform 3D conversions. Thus inspired, I tested my theory by trying out a 3D conversion of the historic 'Invisible Man' centenary edition. Although very simple and basic, I think it's enough to show that the principle works. I know it's not very impressive but A.G.Bell's first phone call was less than earth-shattering, as was J. L.Baird's original TV broadcast. To me, finally seeing the episode in 3D was one of the most satisfying moments of my life (so far). The next step is for me to draw a strip especially designed for 3D. May be a while as, as ever, I'm extremely busy, but I'll be sure to keep you informed. The final breakthroughs (or possibly breaksthrough) do not involve you directly, but are also concerned with 3D. I don't know if I told you, but I was recently able to buy a second Pentax digital camera. I wanted one with a swivel screen, to make it easier to take self-portraits (see Frescos yet to come). I found such a camera in my local Asda's. It had been hanging around there for a few years, and they agreed to sell it to me for £80. Imagine my delight when I found it had the capability of taking stereo pairs, but using a much better system than that on my more recent Pentax camera. After taking the first frame, it shows you a ghost image to help you line up the second. Only static subjects, of course, and only in portrait format. 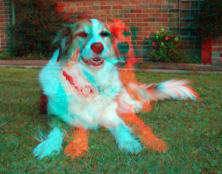 The camera came with a 3D viewer, but I prefer to convert the pictures to anaglyph. I hoped that I might be able to use this camera (which cost, I now discover, over £280 when it came out in 2003) in tandem with my other one, to produce better, clearer images than my cheap Vivitar cameras. My first experiment was a limited success, as the two cameras were not precisely the same and not in complete alignment. Then came the breakthrough. Again using Elements 2 (which only cost me £20 and, anyway, my poor old PCs won't take the newer versions of Elements), I found that I could manipulate the images to give spectacular and depth-enhancing results. I saved the photos as bitmap files, which are far too big to e-mail. 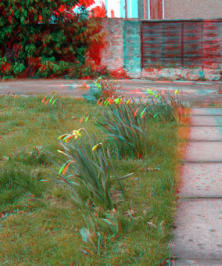 I've adapted a couple of examples - Flossie The Dog and Daffodils In Bud - to the attached lower-res jpegs. I have some A4 prints of the originals framed on the wall and they're extremely impressive! 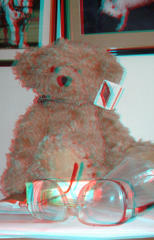 Remember, a few moments ago, I said that the snag with the camera's 3D system was that I could only use it in portrait format - see the test pictures of Books and Trevor Bear, also attached? Well, yesterday, I made my final breakthrough to date. If I hold the camera sideways, I can then achieve the desired separation by shifting it up and down rather than side to side. I enclose the result of my first test (the rose). Not wonderful but not bad for a pioneer attempt. Macro, too! That just about brings me up to date. Sorry to ramble on so, but these are subjects dear to my heart. 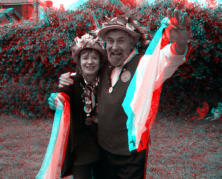 In the eighties, I was known to a comics dealer purely as 'The 3D Man'. October 2006 I thought it was about time I sent you my latest efforts on the 3D front. I've recently bought a 'twinning bar' for mounting two cameras side by side. I can also put them on a tripod which means, for the first time, I can take 3D self-portraits. The Pentax cameras I use are not identical, but I'm proud to say that I've devised a way of using PhotoShop Elements 2 to manipulate the photos until they match. December 2006 I've had a passion for 3D ever since I was ten. Even at primary school, I was making primitive attempts to draw in 3D. But it's taken years of experiment finally to make the technological breakthrough that has enabled me to bring you today's special 200th episode of Fresco in exclusive new JeoVision 3D©. You'll need your red/blue 3D glasses to experience the effect - make sure the red lens is over your left eye. 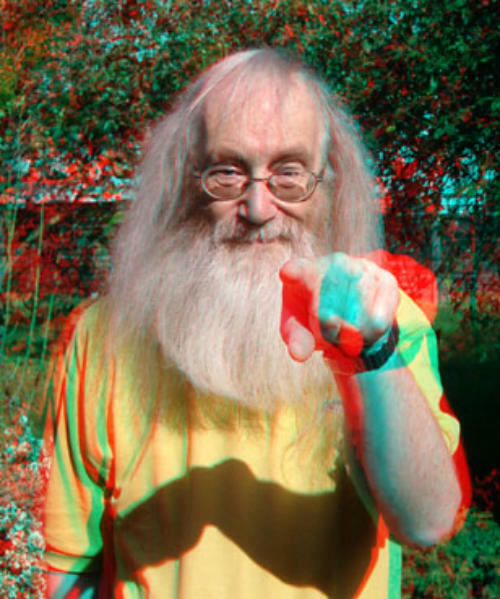 If you're one of the poor souls who doesn't have access to 3D glasses, I'm also enclosing a plain old 2D version.